Starring Rip Torn, Patricia Barry, Richard Anderson. Written and Directed by Douglas Heyes. Duncan Corey (Torn) is set to inherit his late brother's house on a valuable plot of land, and there's just one small catch. According to the will, he must spend a night in the house and then live in it for a year, or it will go to his cousins (Barry and Anderson). Determined to land the inheritance, he doesn't let his cousins' warnings trouble him when they bring him to the house for his initial stay. Clearly the sounds he hears in the night are their attempts to scare him off... or are they? JS: Now we're talking! While not flawless, "The Purple Room" is hands down the best episode in the series thus far. It's creepy, benefiting greatly from the locations (the exteriors at the famed Psycho house on the Universal lot), and a well dressed interior set. There's even a creepy ghost (which the folks at Image were kind enough to include on the episode menu screen)... or is there? PE: Down through the years, this episode has gained a reputation as one of the “key” horror episodes of Thriller but SPOILER WARNING!! it really has no horror elements at all. Oh, it’s got the scares, but they're more along the lines of the faux shocks you’ll find in House on Haunted Hill (the version starring Vincent Price, naturally) or one of those Lights Out radio shows where you find out that the ghoul is actually the ex-boyfriend seeking revenge for being spurned. That’s not to say this isn’t a good show. It’s well-acted by its two male leads (Patricia Barry is a bit on the histrionic side for my tastes) and it does maintain a modicum of suspense given its limited plot line. Rip Torn gives a solid, at times humorous, performance and Richard Anderson is, well, Richard Anderson. He could very well be on his way to NASA for his big interview with Steve Austin. Many critics, I’m sure, would label Anderson’s acting as cold or wooden. I think that’s just what’s needed in the role of Oliver Judson, who has to shift from seemingly concerned about Duncan’s well-being to devious schemer in just a matter of hours. He has to keep up this facade for both Oliver and the viewer and does so admirably. JS: Don't forget the great if brief appearance of Alfred Pennyworth (Alan Napier) as the executor of the will. Who'd have thought he'd need to moonlight from his day job at stately Wayne Manor! PE (channeling Richard Anderson in a very hushed and serious tone): “I was going for an ice cream which is a funny thing to do in Hollywood, going for an ice cream, when I was plucked from my natural demeanor and…oh, see that, see how I twitched my left eye, I learned that from Kubrick….where was I, oh yes, …oh see that, that chair in the corner is the one that Mrs. Bates sat in…I remember reading the script for…what’s this thing called again…I thought big house, black and white, 1960…gotta be Psycho, right?...I thought I was reading for Psycho..."
Douglas Heyes wrote a couple of pretty good hardboiled crime novels, and Rip Torn's a Texas boy, so I'm glad to see this episode rates 3 Karloffs. I definitely agree that this is the first of the quality "Thriller" horror shows. It makes the previous 6 episodes look pretty tame. I can't help but believe that this was because producer Fletcher Markle was fired and William Frye took over starting with "The Purple Room". I mean what did Markle think he was dealing with when he had Boris Karloff as the host? Karloff stood for horror and the supernatural, not for just mystery and bland drama. I really believe most viewers must have been tuning in thinking that Karloff would be giving them horror. Well, they finally got it with the 7th episode and William Frye in charge. I just have one tiny nitpick--that sort of plot was Inner Sanctum's bailiwick...not Lights Out's. Oboler's horror tales rarely took the old Scooby-Doo "oh-it's-old-Mr.-Crabtree-in-disguise" out...he wrote some horror tales with real what-the-f^^k? endings that couldn't be explained away. You're absolutely right, Ivan. I've listened to enough of both of those shows to know better. I even referenced the Chaney films in an earlier entry. You see, this show has pushed me so close to the brink (just wait til you se tomorrow's entry!) that I'm forgetting even the trivia I took for granted not so long ago. What a difference a producer (and an imaginative director) can make! Fletcher Markle is OUT (with a couple more of his dreary crime shows still in the can) and William Frye has begun to slowly guide "Thriller" into its glory period. As we go forward, bear in mind---especially you younger guys who are immersed in the horror genre and everything that's happened in the past 50 years---that "Thriller's" ultimate accomplishment---considering the restrictive limits on acceptable material in 1960, and the impossible crush of producing a new, hour-long, TV anthology, mini-movie EVERY WEEK---- was nothing short of amazing... and I think we must continue to judge its successes AND its flaws with this in mind. 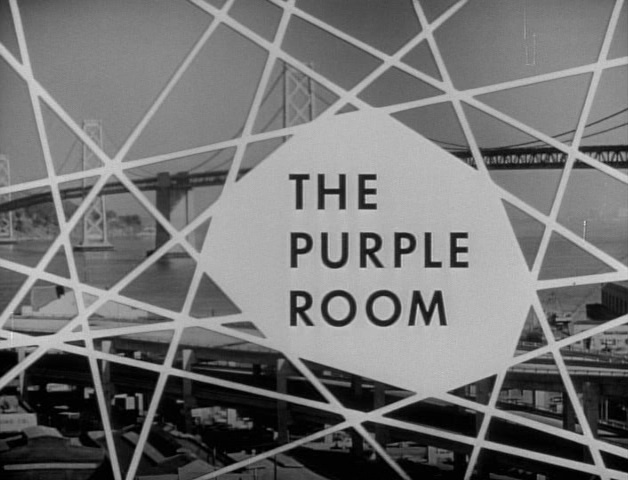 I would include "Purple Room" among my dozen favrorite Thrillers---it's just so damned cool and atmospheric, ESPECIALLY for a guy (me)who remembers that great Halloween/fall/spooky time-of-year feeling in the late 50's; this episode ABSOLUTELY captures it. Karloff's intro is superb; note how he rushes onscreen, while the background does a few in-and-out-of focus shifts. (I was puzzled by the commentary's discussion of Richard Anderson being on the set with Karloff for this intro; looks to me like rear-projection: how else could the out-of-focus background thing be done? Also, the 3 principal actors look distinctly "down a generation" in terms of visual clarity compared to Boris). Rip Torn's performance is a text-book example of a young, N.Y. trained actor methodically working his way from caustic and cynical to that creepy, crawly, pit-of-stomach terror that results in a total stroke-out. Masterful. I love Pete Rugolo's contemporary, late-50's jazz/horror infused score for this specific episode....those eerie whistling violin harmonics, the ominously thumping drums and plucked strings, the cheezy electronic organ/Novachord playing the "Thriller" motif...very cool stuff, especially during Richard Anderson's long story-telling scene, when Doug Heyes shows us nothing but spooky shots of the gloomy, elegant, 19th-century room. Admittedly, the post-ghost progression of "Purple Room" is a let-down, though Richard Anderson's OWN monologue, with the roles now reveresed as HE now addresses a dark room and confronts a terrifying apparition, is very effective. I thought the actor was remarkably aritculate in his commentary, considering the 50-years that separate him from this show (as of this writing, all Three principal actors from "Purple Room" are alive and kickin'!) Steve Mitchell does a great job rounding out Anderson's career in relationship to this specific episode. I have always admired Anderson's poise and subtle "bite" onscreen, though his range is a tad limited. If you want to see him at his best, check "Combat's" 2nd season "Silent Cry". Richard Anderson (aka Oscar Goldman for you "Six Million Dollar Man"
finally emerges, it's actually a truly creepy sight. Five out of five, baby! The central idea of the original murder is quite powerful; if THRILLER had just dramatized that nightmarish scenario straight-on, wow! As is, there's some juicy "what's coming up the stairs" suspense in the ultimately contrived and just a little too ironic Doug Heyes teleplay. But hey, classic-style spookiness abounds, with the PSYCHO house setting the tone. And as for the "Ghost", yep, it's Bud Westmore's (Jack Kevan's?) head appliance from MAN OF A THOUSAND FACES. Fun Fact: James Bama's amazing painting used as box art for the classic Aurora model kit of the Phantom was indeed based on THOUSAND FACES. But the sculpted head of the Phantom was a weird combination of FACES and Lon Chaney. Recently, a model kit designer created a more accurate version of the FACES/Bama visage, and plunked it on the Aurora Phantom’s body. So the Ghost looks more like the Ghost than ever! I’ll send you guys some photos for comparison. Watched this one last night with my Dad, who had a good laugh at the dreadful dialogue, "backlot!" moments and a young, presumably sober and always excellent Rip Torn. In fact, what really would have shocked the pants off everyone at the end would be when Patricia Barry is hyperventilating in bed with that smoke wagon...waiting for the ghost...waiting...and it's Rip Torn 50 years later, with a fifth of Wild Turkey in his bloodstream, bleeding from an ear, waving a Remington 870 while asking: "Is this where I do my banking?" Definitely the spookiest episode of the first seven SHITTERS. This was the frist THRILLER I ever saw. Some kid in my class told me to check it out as he saw the preview. I was sold on the show and stuck with it through thick and thin from then on. I remember talking about it the next morning with my classmates. Cool episode, but maybe my brain cells are fading because after watching it straight through and then with the commentary I still can't quite get what happened. So Rip Torn wasn't dead, even though they checked him out, carried him down the stairs, put him in the car, and left him in a swamp? And then he wakes up, feels better, and decides to meander back to the house, past Richard Anderson, up the stairs, and into Patricia Barry's bedroom, where he stands there like a dope while she shoots him? And this is the guy who knew the whole story about the prior shooting? It just seemed kind of unlikely to me---but still cool! Atmosphere - check. Tense acting - check. Appropriately hair-raising music - double check. Although i wasn't buying the story, was bothered by the prelogue of Ms. Heyes as the captain's bride, and felt the whole 'Anderson describes the ghost tale' seemed completely tacked on as filler, it whetted my appetite for more. I can't say it struck gold, as the whole payoff kind of went 'Phfftt!' when we barely saw Rip's corpse and Sheriff Coffey comes in and genially finks out the house crashers. Still, seven out of 10. Ok, getting better, but still not quite there. The Psycho House and Oscar Goldman just detracted too much for me. And a young Rip Torn. Ghost scene was a bit creepy as it was coming out of the shadows, but then just went into lameness. Atmosphere in spades, though. Enjoyed this one, though it doesn't yet offer up the chills I recall from Thriller reruns of my youth. Well, no old bittie, no reprehensible upper class people, that counts for something, but the old reliable sound stage makes an appearance again. This is by far the best of the first seven, but was disappointing in that it was not supernatural. Good post about why Rip Torn's character wasn't dead; that bothered me, too. I have to admit watching these first seven episodes I can't get out of my head how frugal the budgets must have been. I really wasn't digging the re-telling of the 100-year old story with just shots of the house. And during the Rip Torn part I kept wondering how the hell they were going to stretch this thing out for an hour. Thankfully the ghost appeared half way through and the plot got a second wind and moved on. Still...all in all I was disappointed, although the Karloff introduction was definitely better, and this was the first time I felt the score was kind of aligned with the atmosphere. Those bongos and flutes had been rather jarring through the first six. I hope the next few episodes don't fall back to the tedium of the first five (the gangster one wasn't that bad for having no action at all until the abrupt ending). I plan to watch this episode tonight. Meanwhile, I'd like to take a moment to discuss the music of THRILLER. At this point, all has been credited to Pete Rugolo. No doubt he is a talented artist, but his selection of contemporary jazz music is oh so wrong for this series. With all the blarring trumpets and bongo drums, I'm expecting to see a chorus line of dancing girls followed by Joey Bishop from stage left. Maybe they should have had Bishop host it instead of Karloff... "As sure as my name is Joey Bishop, I can assure you this is a Thrilla Daddy-O!" Rugolo's music seems a bit more somber in the last episode (maybe it's just wishful thinking), but I will be forever grateful when Jerry Goldsmith and Morton Stevens takes over the music duties. My fondest memories of the THRILLER series was the music. Imagine my disappointment when I discovered that the series kicked off with a very contemporary and dated jazz soundtrack. I guess the audience at the time found it trendy, but I have to imagine they too saw how music and imagine did not mesh. Enough of my rantings... off to THE PURPLE ROOM. SoSo - You've earned your first merit badge by making it to The Purple Room in one piece. But as you can see from my digrestion of serious comments to goofy remarks, the show has destroyed my will to live. Side note: Ever notice how many people get hit by cars on THRILLER? THE PURPLE ROOM is the first episode that provides a glimpse (and hope) of things to follow. They traded in the tone and mood of suburbia for a richer, gothic haunted house look. Cobwebs, candles, shadows... thanks to the new direction by William Frye and Douglas Heyes. Having it take place at the "Psycho" house only adds to the fun. Richard Anderson did quite well as the swarmy cousin. His performance certainly counter-balanced the agitated role of Rip Torn. Who really is in control here? I too agree with an earlier post regarding Karloff's introduction. It certainly looks like rear projection and not Boris in the actual scene with the actors, as I believe Richard Anderson mis-stated in the commentary. SoSo gives THE PURPLE ROOM a well deserved "3 Karloffs". Liked this episode. Reminded me of an old EC comic! I'm not convinced there isn't a supernatural aspect to the program. Maybe he was near enough dead so that a cursory check would make someone think he was dead. Then he came to, half deranged from the events, spouting the gibberish to the police. Or, maybe . . . He did die. Really, in the time it took to place the car, there wasn't a hint that he was alive.? How about, instead, the body wasn't so damaged as to prevent Jeremy's ghost from possessing and animating it. Jeremy, forced to relive the events of his final night. That would explain what he said to the policeman and why he went past Oliver. Rodney, this was my take on this episode too. I'm glad someone else had this suspicion. 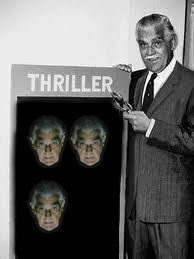 If we're right I think it elevates the story enough to add half an extra Karloff. Finally some monster kid horror goodies! This episode starts off with a very nice intro from Boris that psyches me up! It's funny to see a young Rip Van Torn. These days any mention of him and I immediately think of his infamous disheveled mug shot. A short scene early on with Alfred the butler is nice and reminds me somewhat of when him and Boris were together in the opening scene of Isle of the Dead. The proceedings move on pretty quickly and were off into a 60s version of Cat and the Canary. Patricia Barry and Richard Anderson are good as the scheming cousins. They play it pretty straight, while a Ripped up Torn energetically tries to pry their scam out of them. The atmospherics are great for the scenes in the house. The scene with the Phantom of the Opera ghost is the type of material that I expected of Thiller. After Rip falls and the cousin's antics are revealed is the plot starts to get a bit too loose and convoluted. As others have written, it would have been nice for an explanation of how Rip came back from the dead. The final fatal shooting dovetails nicely with the old legend and thus concludes what I'm sure everyone can agree, is the first classic episode of Thriller. I will decorate the Purple Room with 3 1/2 Karloffs. I really liked the banter between Richard Anderson and Patricia Barry as they were cleaning everything up in the second half. It reminded me of my favorite THRILLER episode, "Masquerade." SoSo--With regards to Rugolo's music, that was his style...the very loud, overly brassy scores (i.e., The Fugitive, Run For Your Life, Felony Squad) fit other shows he worked on better than this one, but he was who they hired. SoSo is SO right about Rugolo's music. The aspect that isn't noted so far is that throughout these opening episodes he insists on recycling elements of his horrible theme song (which Image unfortunately chose to put behind the DVD menu animation so we have to hear that crap time and time again.) After about three episodes we've heard WAY too much of that opening eschapee (WARNING: COLLEGE MUSIC EDUCATION IN OPERATION) -- dah-DAAAAAAAH-da -- and the intrusive "deedlely" triplets in the break - da-DAH da-DAH da-DEEDLELY-deeee. Ugh. I suppose this was done to give some semblance of continuity to an anthology show; but it just makes me want to poke a #2 pencil through my eardrums. 2.5/4. Now it gets spooky! Excellent cinematography. Loved this one...thought Torn was outstanding. Deserving of it's status as one of the top ten fan favorites on DVD. Thanks so much guys for composing this aThrilleraDay web page. I respect your opinions...great job. I said last night of "A Good Imagination", that Thriller shows seemed to be either dull, padded snoozefests, or flawed gems, but that I was having trouble finding ones that I really liked without considerable reservation. "The Purple Room", while not as flawed as "A Good Imagination" still falls into the flawed gem category. Everyone seems to like this one, and I wish I could too. There are certainly many things to like about it, mostly the atmosphere and cinematography. The problem with "The Purple Room", as with "The Well of Doom" and others is that the twist at the end is that there is no twist. We've figured out the whole plot very early on (Anderson and Barry are trying to scare Torn out of the house), and nothing happens to change that. Not only do we figure that plot out very early on, but Torn loudly announces it at every opportunity. This leads the viewer to think "Oh, it can't be that simple", but yeah, it really is that simple. No more, no less. The bit at the end where Torn is actually alive is tacked on, and doesn't fundamentally change what the plot was all along. Despite suspsecting Anderson from the beginning, Torn cheerfully has a drink with him anyway. There's no mystery to us about why he conks out. He tells us. Therefore, when he wakes up and his gun is still there, the possibility that it may have been tampered with was the first thing I thought of. It never occured to Torn, though. 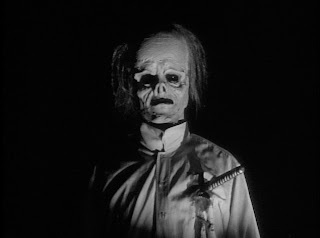 Despite believing that Anderson was out to scare him, the sight of Anderson in a mask a few minutes later is sufficient to scare him to death. The fact that he was drugged proves that this is no ghostly influence. The fact that they didn't take his gun proves that it's not going to be of any use. You can say that Torn is too frightened to figure this out, but even frightened, it's too simple to miss. I kept thinking that it can't be this neat and pat. If I've figured it out this deeply, there's got to be some big twist or revelation to change things. Nope. Nothing. So they dump him somewhere or other, but surprise, surprise, Torn isn't really dead. He staggers back to his house, Anderson and Barry think he's a ghost, and so kill him again just to make sure, then realize their mistake. Okay, these scenes are effectively done, but they're all NEW plot. They don't do anything to alter the original plot, which was laid out before us in full five minutes into the show, with nary a twist or swerve to fool us along the way. Anderson's character wasn't a doctor, was he? Since they didn't actually do anything to kill Torn, my first thought, even on a dark and stormy night in a really spooky mansion, would have been "Whoops, I guess he wasn't really dead after all". This is a good episode, but the plot depends too heavily on everyone drinking the dumb water for it to be great. So why does the cop say Corey said someone was trying to kill "him and his wife"? Are we supposed to presume that Corey's body was now possessed by the original dead guy? I have commented on three Thriller episodes so far. These are currently being shown on ME TV on Sundays, 9:00 pm CST Daylight Time in the original order first shown on NBC. 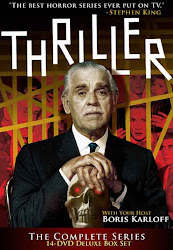 I first viewed Thriller when it was shown-I was 11 in 1960. I trust the ME TV versions have not been edited or cut to fit in more commercials? This episode did have initial shock value when I first saw it. The resolution to the episode is wanting-hey, the abandonment of the "corpse in the car" shades of Pyscho--good ole Hitch! The ghost mask--well, back in 1960--scary for an 11 year od. Now, mucho camp! My sentiments, as well--no comments since 2013 considering ME TV's rerun at this which will surely end eventually. Yes--ME TV's reruns will end eventually--too bad they are not in chronological order these days per the Thriller Episodes. Hey--keeps us on our toes. There is more than one comment above (including Peter's initial one) suggesting that although this was a good episode, there was no real supernatural element, just a person dressed up as a ghost going "Boo! ", but that misses a couple of important bits of dialogue near the end. Before that, however, there's some foreshadowing at the beginning, when the executor of Duncan's brother's estate warns him that "some people are repelled by their first impressions of it". When the Judson's returned to the house after deposing of Duncan's body in a car out in the swamp, Oliver recounts the (seeming?) scaring to death of his cousin and how he'd switched the bullets in Duncan's gun to blanks. Rachel stops him to say she was "frightened" watching it, because she felt "some other presence" in the room, "as if Jeremy Ransom and Caroline were...backing you up, egging you on." Later, after Rachel shoots to death Duncan as he returns to from the swamp dazed but alive, to confront her in the Purple Room. She hurried downstairs to find Oliver sitting at the bottom step, traumatized by having seen Duncan's "ghost". And here's where the second clue that the supernatural played apart. As she's telling him she killed Duncan, Sheriff Wiley arrives, explaining that "...we found your wagon down by the bayou with some stranger was in it. Fellow said his name was Ransom, Jeremy Ransom. He was out of his head, said someone was trying to kill him and his wife. So he ran off and we're looking for him. Did he come this way?" Clearly, the man seen was Duncan, but why did he tell the sheriff he was Jeremy, who'd been dead for a century? Could Oliver's "ghosting" of him been so traumatic for Duncan that when he came to he had become delirious and simultaneously suffered from amnesia? Not likely, because if that were the case, he'd also be disoriented by gaining consciousness in the middle of unfamiliar surroundings. Rather than running off as the sheriff relates, he wouldn't have been able to find his way back to the house that quickly, and if he was able to run (unlikely given his condition), he also wouldn't be dragging a leg as he did when confronting Oliver. Not to mention that a house in the middle of the night with no electric lighting would have been tough to find anyway. So for Jeremy/Duncan to run off in such a way as to disappear from the sheriff and his deputy most likely is explained most plausibly by saying the spirit of Jeremy had taken over Duncan, which is why he told them he was Jeremy and was fearful for the safety of he and his wife. Upon hearing such a thing, an officer would want to detain such a man to find out more about why he thought someone wanted to do him harm and to provide safety by apprehending the culprit. That Sheriff Wiley wasn't able to do so makes it seem as though Duncan's body was transported back to the house in a preternatural manner. Why would Jeremy want to go back to the house to be shot again? Could it be that he didn't want anyone living in it? Didn't want it to be bulldozed under for a development? Wouldn't he want to not be forced to relive the ghastly night of his death or did having Duncan unwittingly reenact the dread night somehow end the cycle forever, freeing Jeremy and his wife? There are plenty of plot holes in this, either being unexplained or extremely unlikely (how would Oliver know what kind of gun his cousin had, enabling him to switch to blanks and even if he did know, are blanks that easily obtained for the average person?). Still, the supernatural seems to play a large, if subdued, role in this episode. Yes i agree,there is such supernatural elements that story could stayed out as crime thriller.It would been cool after torns death after Patricia Berry shoots him it was real ghost and then cop nabs them for torns murder.Sometimes the producer isn't as great as hired.I was writer in school and certainly could change that tune in this episode and Well Of Doom.Over all it had every thing going for it.